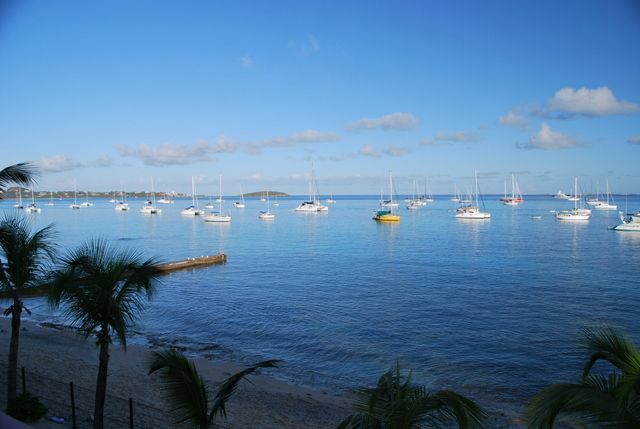 Beautiful 2nd floor flat condominium with elevator, in a private building, securised, easy for mothers and children as well as seniors, located at 500 yards from the center of the typical French Antilles town Marigot. The studio will sleep 2 to 4 people. All is equipped to make your vacation feel as easy as at home. Wifi internet. The view is unforgettable at sunset facing the island of Anguila you'll have a drink looking at the sea, on the balcony, meanwhile your children or friends will be in the swimming pool waiting for you. During day time, after swimming, you can enjoy at 10 minutes only the pleasures of golf or go shopping French or Dutch side. Next to you: post office, bakery, supermarkets, convenience stores, laundromat, all what you need. In the evening you may try excellent French restaurants downtown or go to the Dutch part to enjoy yourself in casinos or eating so wonderful American steaks. Studio is located at less than 1000 feet from Marigot’s town center with all restaurants, shops, banks and market, just close the two marinas : Fort Louis' Marina ocean front and Marina Royale on the lagoon. 15 mn by car and you are in the Dutch part of the island. If you need a car, we have a special rate with NONO CAR RENTAL : about $45 per day for a KIA Picanto, bigger cars if you want (Jeep Wangler ...) to negociate. NONO can pick you up at Juliana Airport if you agree. You can use taxis, and cheaper 'bus collectifs'. Regular boats are leaving to Anguillas or St Barth islands each day. You have the choice of more than 10 beautiful beaches around the island. A second similar condo, is available on request. My name is Sylvie, I am 69, mother of two children and grandmother of 6 grandchildren. I am a psychologist. Leaving near Paris, I am married to a captain flying on Boeing 777. We enjoy very much travelling to the US and do like riding Harley Davidson through the whole country. It is a private securised property with interphone access during the day and a sheriff watching during the night. The building is clean and located in a safe area, close to the center of Marigot City. We know that St. Martin is still recovering from Irma/Maria so everything can not be perfect. The repairs will take time but everyone is working hard to make buildings secure again. Our condo was just the right size for us for 10 days. It was very clean and we had everything that we needed. Hope to go back next year! The islanders and the vibe of St. Martin are tremendously charming and will beckon me to return! I'm giving this studio five stars as it is well-maintained and furnished and basically everything I needed--a non-touristy, quiet place to relax and rejuvenate. Emails with the owner were full of helpful information. Francesca, who met me to hand off the keys and get me settled, was very helpful and dropped me off at the closest grocery store (a 5 minute walk) so I'd know where it was. My brief encounters with neighbors were all very friendly. As St. Martin is still recovering from Hurricane Irma, the apartment building is under construction. The bottom floor of the building was wiped out and the building is covered in scaffolding, with much of the beach behind the building fenced off. This of course, is no fault of the studio apartment itself, and I wasn't bothered at all with any construction. Instead of laying on the beach behind the apartment as I thought I might do, I took a bus for $3.00 round-trip to Grande Cayes where I hung out at Captain Frenchy's that had a great beach, a bar, good company and excellent food. Not a bad trade off in the end. I do not know when the construction on the apartment building will be complete, but it wasn't even a bother, so I'd encourage anyone to not let it dissuade you. Besides, one of the reasons I chose to holiday in St. Martin, besides the respite, was to help boost the economy as they recover. I'm happy to see the number of cruise ships arriving in St. Martin daily--though thankfully they arrive on the Dutch side so that it's much quieter on the French side. My wife and I spent 22 nights in this studio apartment. As indicated in all of the other favorable reviews, the location is uniquely situated with beach view from the balcony, walking distance to a super market, walking distance to the Marina Royale, plus walking distance to downtown Marigot. The amenities are accurately documented in the VRBO information. The owners are very responsive. We had the chance to meet Sylvie and Jean-Claude, and it was a real bonus to what was already a unique vacation experience. It is clear that they have successfully assisted many vacationers who have used and re-used this lovely little condo. We've stayed in this condo and also a second one owned by this same couple. In fact, the first review on this page is mine as well. The owners are excellent to deal with and answer questions promptly. I agree wholeheartedly with all the other great reviews by the satisfied vacationers on this page! Thanks again to the owners for another great year. Price are for two guests. An additional charge per guest above two is requested for each week or stay less than 7 days.